I was wondering why Dutch caravans crowd our Autobahn every summer. So, I googled the Web to find out what makes them go on vacation with a caravan. First thing I checked was how popular camping is in the Netherlands. According to google trends it is pretty popular 🙂 People from the Netherlands are #1 in the world when it comes to googling for “camping”. My research went on to discover the reasons. Unfortunately, there was no definite reason or centuries old Dutch tradition that explains the yearly habit. But several points came up that draw a picture. Dutch obviously do have some specific preferences regarding their vacations. In particular, regarding food, children and the accommodation. 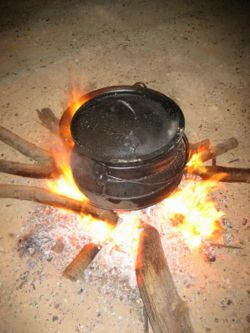 I also discovered that there is such a thing as a Dutch oven. Most likely everyone has seen one of these in a Western movie. The Dutch call it potje. The Dutch must love children! One of the reasons that Dutch prefer camping is their children. Camping is definitely a family thing and children love camping. That is probably also the reason why this becomes a sort of tradition. Every Dutch remembers the great time he had on camping vacations in his childhood. A major reason is a weakness for unusual accommodations, but also the freedom a caravan gives. A caravan allows a comfortable road trip with a motel on board. Nonetheless, prefering a caravan over a hotel room must be a Dutch thing 😉 But Dutch do love unusual accommodations as stated by Ben Thijsen a Dutch entrepreneur who bought an old Eastern German airplane and turned it into a hotel. 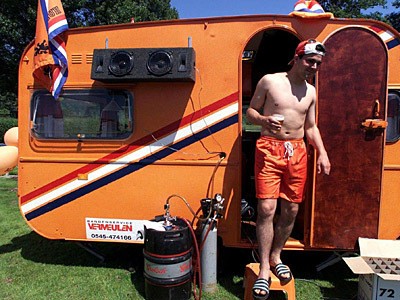 Dutch must love camping so much they even drove down to the world championships in south africa 2010 in caravans.